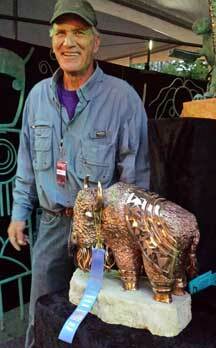 I am a contemporary sculptor and member of the Oneida Nation of Green Bay, Turtle Clan. I was involved in Native American education at an administrative level for 12 years, and was instrumental in establishing several Native American scholarships for Wisconsin colleges. I continue to be an advocate of education by promoting the importance of Native American awareness through my sculpture, and by my interactive storytelling-style with perspective customers and young audiences. Many of my designs are inspired by ancient Woodland petroglyphs and pictographs celebrating nature, gender and Native art and culture. 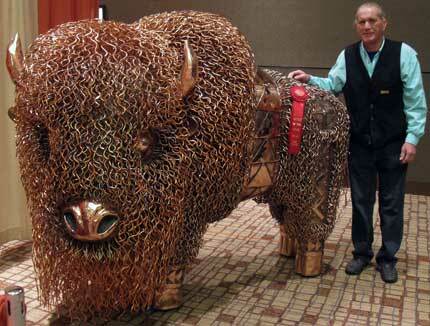 The sculptures are created from copper as were decorative and functional items from the Great Lakes area tribes. Each sculpture is hand cut, welded in silver and then air brushed with a patina finish to enhance the copper’s natural aging process. To give some pieces even more life and a three dimensional form, I utilize an old expanded welding technique taught to me by my grandfather. Traditional Iroquois border designs, quill and beaded symbols and patterns created in copper complement my sculptures while visually teaching Native art history. Select sculptures are embellished with deer hide, antlers, traditionally wrapped antique trade beads and horsehair. Each sculpture’s descriptive tag includes a name written in English and in the Oneida language. 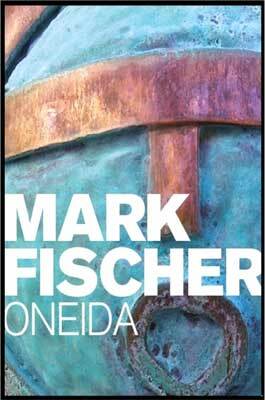 A second tag tells an Oneida/Iroquois story, prayer, poem or cultural statement. I’ve recently added a line of functional art including tables, chairs, benches and tree lamps adorned with traditional Iroquois floral designs and ancient patterns. It is said that the ancient nations did not have a written language, but if you look, you will see they have left messages all over our nation. It is an honor to share these non-verbal messages through my art. I am proud of my Native American heritage. 1998 Smithsonian Christmas Catalog purchase/order: "Moose Man"
1998 Smithsonian National Museum of American Indian purchased 3 pieces- "Friends", "Cedar", "Three Sisters"
2002 Dept. of Interior purchase of several pieces: new gallery-Washington D.C.
2004 Dept. of Interior gallery exhibition of Contemporary Iroquois Art-WashingtonD.C. 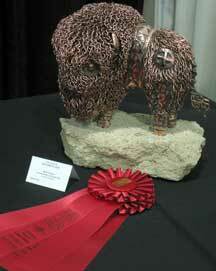 2013 Woodland Indian Art Market for "People's Choice"